Over a month later, I am finally sharing the Valentine’s Day dessert I made for my husband and I. For the holiday, we prefer having a nice dinner at home. 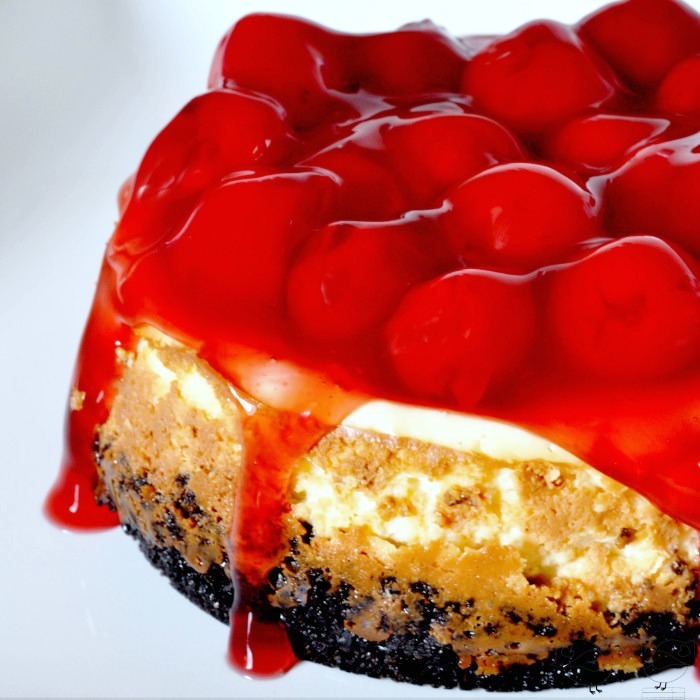 We had some brie as an appetizer, steaks, mushrooms and Sriracha broccoli bites for dinner, and this delicious mini Oreo Cherry Cheesecake! While I love a good dessert, I don’t want a huge serving for just the two of us. I would certainly eat a 9″ cheesecake, but I definitely don’t need it. I am working on making smaller sized desserts, and the first step of making that happen is finding smaller pan sizes to make them in. I used Wilton 4″ springform pans that came as a set of 3 for under $10. This recipe will make two of those pans. First, you will want to make the crust. Remove the cream fillings from the Oreos and ground them up into a fine consistency. Stir together the crushed Oreos, butter, and sugar. Divide the mixture between the two springform pans and press down to make a solid crust. If you prefer, you can allow the crust to go up on the edge or leave a flat crust. In a large mixing bowl, beat together the cream cheese and sugar until light and fluffy. I used a hand-mixer on slow-medium. Then, beat in the egg, vanilla, sour cream and cornstarch on slow-medium until well blended. Divide the mixture into the two pans over the prepared crust. You want to leave a little space at the top of the pan for the cheesecake to rise. Bake cheesecakes for 25 to 30 minutes or until the center is almost set. Turn off the oven, and allow the cakes to cool in the oven with the door slightly propped open for at least 30 minutes. Chill in pan for at least a couple hours. When you go to remove the cheesecake from the pan, first take a knife and run it along the edges of the pan. This will help to make sure it is loosened before separating. I was making so many items items on Valentine’s Day that I decided to use a jar of cherry pie filling for the top. 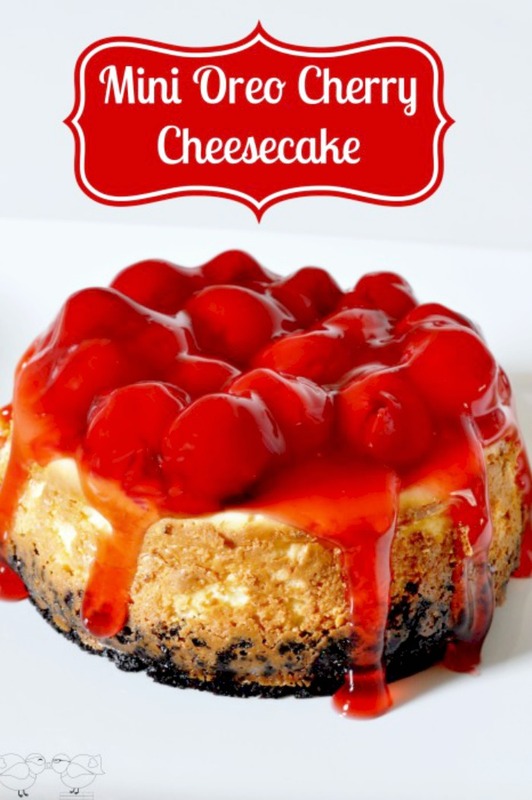 I am sure fresh would be even better – like this recipe from Gina at Kleinworth and Co.
Do you have a favorite cheesecake? I LOVE the look of these , lady! They’re so inviting & lovely, plus I’ve got a huge thing for cherries! Love the addition of Oreos, too! 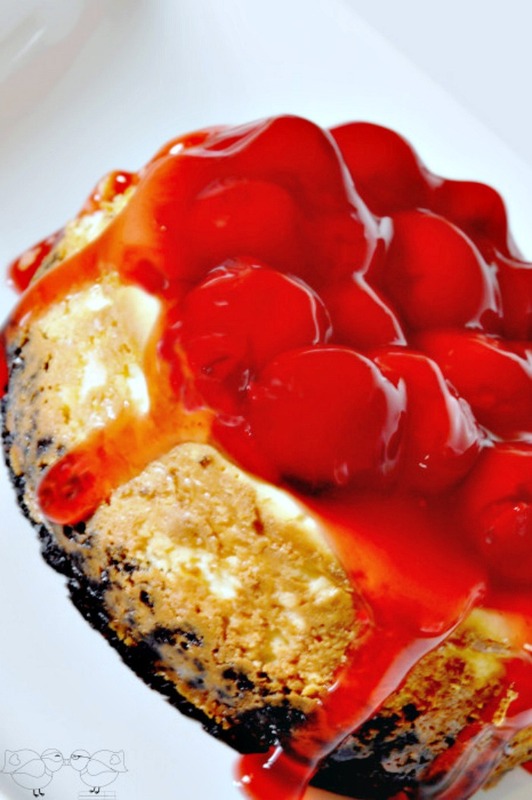 Maggie, this wonderful mini oreo cherry cheesecake will be the star of our holiday dinner. It’s an easy recipe and the mini size is great to share. Can’t wait to make them. Mmmmm… scrumptious cheesecake! Yay! This looks so lovely! Thanks for the recipe! This sounds oh so delicious. Its got everything i love in a dessert! Pinned! That looks so good!!! I’ve never tried to make it mini before. Yum! Maggie this looks delicious! Thank you for sharing at The Wednesday Round Up! I love cheesecake but only in small amounts. It’s so rich I can never finish my piece. G’day! Love cheesecake and love oreos too! YUM! That is a seriously gorgeous cheesecake! I love the colours! This looks so good!! And it looks pretty, too!! Hey, Oreos go with anything!! LOL!! Oh my goodness, these look crazy amazing! Must have these! Thanks for the yummy recipe! that looks wonderful and looks professionally made too! I recently realized that cheesecake is so easy to make! Your little cakes look so yummy!! Oh my gosh. I love this. Im going to have to make this. This reminds me so much of a dessert my mom would make for us as kids. I can’t wait to give this one a shot! LOVE cheesecake… more than any human probably should. That look delicious! Cheesecake is probably my favorite dessert. This one has my mouth watering. That is an awesome combination. You pretty much took all of my favorite things and put them together in one mouth-watering recipe. I think some cheesecake making is in my future this weekend! Thanks for the recipe. well, now. hello, my new love. oreos. and mini stuff. love! I love this cheesecake and Oreos – pinned! You’re killing me with those pictures. This looks absolutely amazing!